It's been a few years since I first started to suspect I might have a problem. I played the Mass Effect games as an infiltrator. I played the Dragon Age games as a rogue. 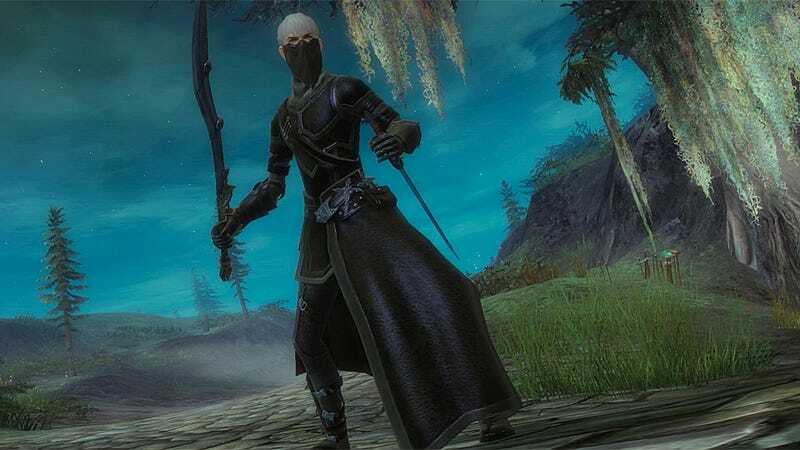 I tried Guild Wars 2 as a thief and dabbled in World of Warcraft as a rogue. I tried Star Wars: The Old Republic as a smuggler. In Fallout 3 and New Vegas I always leveled up my sneaking and speech ahead of everything else. Even in BioShock I tended to crouch and crawl carefully, keeping to shadows, in search of my next destination. Clearly, I have a preferred way to play. But recently, I've been realizing that my preferences have become my habits, and that my habits have become a comfort zone I've become walled into without meaning to. It's certainly not that I can't play games where skulking isn't allowed. I've done my share of brute melee smashing, as in God of War, or of cover-based non-stealthy play as in Uncharted. But whenever I'm given the choice, I go straight for sneaking, stabbing, and sniping. And games that emphasize some kind of slow, careful choosing—like the Assassin's Creed or Metal Gear Solid series—somehow call to me. It's as if I have inadvertently programmed myself to feel that in all situations, the best defense is to go unnoticed. But when does a preference become a problem? For a long time, my ingrained habits were just quirks, with occasionally funny results. For example, during the six years I played EverQuest II, my main character was an Assassin. And out of four characters I eventually had in regular rotation, all but one were of similar classes. The last (actually my most-played alt) was a high-DPS healer who by all rights should have been extremely effective in both solo and group situations. But under my control, she had a nasty habit of constantly trying to flank her enemies, instead of standing still to cast spells. And, for that matter, an equally nasty (if amusing) habit of routinely plummeting to her doom from high places, because healers don't have Safe Fall. It took one of the League of Legends designers watching me play his game at E3 to point out that I always play like a rogue for me to realize how true it is. In games like The Secret World the impulse to get behind my enemy and stay out of reach serves me well. But in other games, not so much. I've been realizing that my preferences have become my habits, and that my habits have become a comfort zone I've become walled into without meaning to. Over time, my natural inclination has become a box. I never did much enjoy playing wizard or sorcerer types, but I've let "not my favorite" become "never," and that's not a good way to play. Not only am I limiting my own experiences, but I may not be giving the games I play their fullest chance to shine. There are times when a two-handed sword, a shotgun, or even a big old fireball are probably more effective (and much easier) ways to fight. So I'm setting myself a new rule: time to break out of my mold. The next game I play where I can select a class or play type, I'm not allowed to pick the roguish one. I'm not giving myself permission to pick sneaking, stabbing, or sniping. It's time for me to step out of the shadows and try something new. And after I roast myself with my own fireballs, or prove to be a terrible defender, I can go back to what I know. But it's like the broccoli of gaming: I have to at least try one bite. And who knows? Like real broccoli, I might just turn out to like it.